Live boating refers to a type of diving in which the boat does not anchor or attach to a mooring. 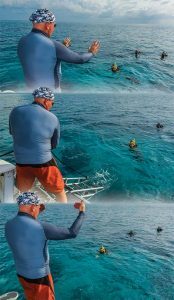 Instead, once the divers enter the water the boat follows a float deployed by the divemaster, or a trail of divers’ bubbles, or both. The divemaster and the boat captain determine the direction of the dive before it begins based on the water conditions, including currents and visibility. Several factors determine the use of live boating. The most common reasons are a strong current, a deep bottom, or divers surfacing at a different location from the entry point of the dive. When using the live boating technique, divers enter the water at the same time. Otherwise, there is a possibility that the first divers in the water may be carried away from the group due to a current, making it difficult for divers to stay together on the surface prior to descending. Pay careful attention to the dive briefing, as important instructions will be given on how you will enter and exit the water. Following the briefing, finish suiting up and be ready to go. The divemaster will enter the water to check on water conditions such as the strength and direction of the current. When he determines that the location is suitable, he will signal the boat captain and crew that it is OK to let you enter the water. Do a buddy check, making sure that all gear is properly hooked up and the air is turned on. If there is a little distance to the boat exit, crewmembers often have you wait until you reach the exit before donning the fins. Or they may have you put your fins on at the same time you are putting on your tank. If this is the case and you need to walk to the exit area in your fins, slowly walk or shuffle sideways to keep from tripping over your fins. Again, this will be spelled out in the dive briefing, so pay close attention and be sure to ask questions if you’re unsure about the procedures. [ONE] Wait for the divemaster’s instructions to descend, unless told otherwise by the crew. Immediately upon entering the water, add air to the buoyancy compensator (BC) to become positively buoyant, then get close to your buddy and wait for the divemaster to give instructions to begin your descent. When the divemaster gives the command to descend (Photo 1) everyone will descend at the same time. 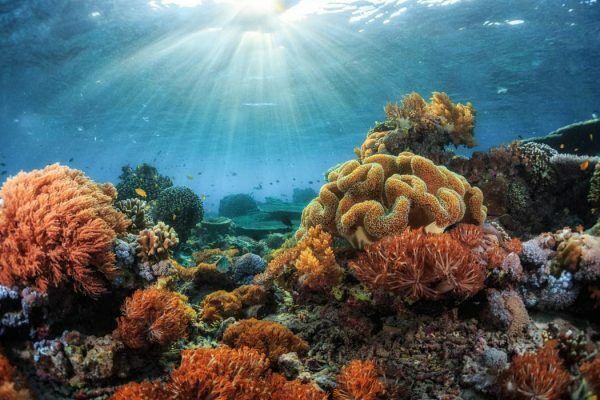 If conditions on the surface are somewhat challenging, such as current, choppy water or large waves, you may be told to descend below the surface with your buddy and wait in the water column or near the bottom for fellow divers. When everyone has made the descent with no problems, the divemaster will signal to follow him. 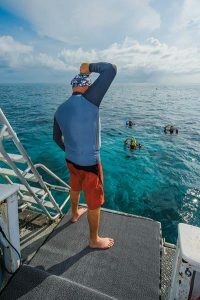 As the dive is coming to an end, if the divemaster didn’t carry a float throughout the dive, he or she will deploy an inflatable surface signaling device, usually some type of brightly colored safety sausage or surface marker buoy (SMB). The SMB serves as a signal to let the boat captain and crew know your location at the end of the dive. [TWO] Upon surfacing, give an OK signal to the crew. Before surfacing, the dive group will routinely perform a three-minute safety stop at depths between 15 and 20 feet (4.5 and 6 m) deep. The divemaster will frequently check with you to be sure all is OK during the safety stop. He may also check your computer’s no-decompression limit to be sure you are still within safe diving limits. Before beginning your ascent, look up in every direction and listen for boats to avoid any boat traffic overhead. Slowly ascend from the safety stop with one arm raised as you reach the surface. Inflate your BC and give an OK sign to the boat crew (Photo 2). As you surface, stay together with the other divers as much as possible so that the crew on the dive boat will be able to quickly, efficiently and safely board all divers. [top to bottom] [THREE] Keep a safe distance from the boat while it is in gear. [FOUR] Often, a crewmember will need to lower the dive ladder before you can exit. [FIVE] Approach the boat only when signaled to do so. Wait for a signal from a crewmember before approaching the boat. You will be signaled to wait until the engine is no longer in gear and the ladder has been lowered (photos 3, 4, 5). If there is a current, the crew will toss a line into the water for you to hold while waiting to board. When it is time for you to exit, pull your way on the line toward the ladder. Always give the person exiting before you plenty of room. 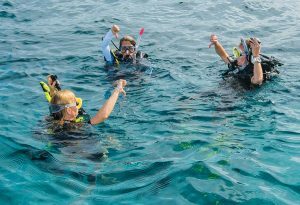 Following too close behind a diver climbing onto the boat can lead to serious injuries to one or both of you if he slips and falls backward. Different crews have different procedures for exiting the water onto the boat. Once again, these procedures are covered in the predive briefing. If you are unsure, ask. Also, if you need special assistance due to a physical disability, make sure you go over this with the boat crew before the dive rather than trying to convey your special needs when returning from the dive. Pay careful attention to the boat, the crew and other divers while waiting at the surface for your turn to board. Remember, the dive isn’t finished until you are safely back on board the boat.